From the archives: In July 2012 we slipped into a church in Venice and found the Cheltenham College Chapel Choir singing. I drew the choir with an A5 Moleskine sketchbook on my lap. 'Il Redentore' is the popular name for the Church of the Most Holy Redeemer. It was built in the 16th century to a design by Andrea Palladio, and is regarded as a masterpiece of Renaissance architecture. It is also home to artworks by Tintoretto, Bassano and Veronese. 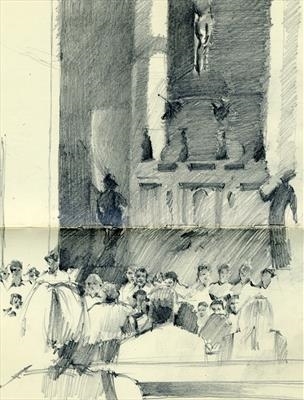 To discover the choir by chance, and to sketch them in this extraordinary place was magical. This sketch is one of eight illustrations in 'Drawing at the Speed of Life', an eight-page feature about my location drawings. It was written by artist/writer/educator John A Parks in New York, and published in the Summer 2016 issue of Drawing magazine in the USA.